30 Thought-Provoking Quotes By Robin Sharma Author Of The Monk Who Sold His Ferrari. 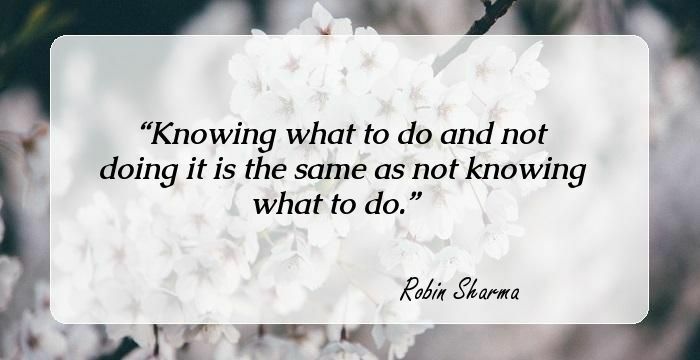 Robin Sharma is a renowned self-help writer who has helped many to change their perspective on life, success and failures. The author reveals the secret to having a fruitful and meaningful life is having a 'one-page plan.' In his own words, "Clarity is the mother of mastery. The one page plan shows what your top 5 priorities are for the year, 5 years, 10 years and lifetime. These are your Big 5s. They give your brain something to focus on in order to see opportunities that you would otherwise miss. It allows you to focus on what is most important to create your life." Sharma also stresses on the importance of feeling fear and overcoming them. As many know Robin has been organizing a business and personal change event 'The Titan Summit' every year since 2013. For the second Titan Summit, Sharma decided to rope in business baron Sir Richard Branson to deliver a speech. It was a big step for someone like Sharma who hailed from a family of immigrants and grew up in small town with population close to two thousand. Everyone who knew him advised him against the idea claiming it to be a bit too ambitious. However Robin remained optimist and despite his fear of facing rejection persevered to achieve his goal. Finally after a long tirade of calls and emails, Sharma was successful in his mission. Just as he says in his books, Sharma is a firm believer of overcoming fear and staying optimistic while facing odds. The following are a few inspirational quotes by the man who actually sold his Ferrari. 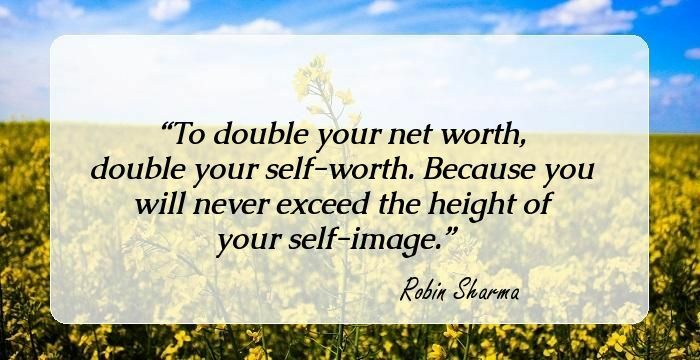 To double your net worth, double your self-worth. Because you will never exceed the height of your self-image. Ordinary people love entertainment. 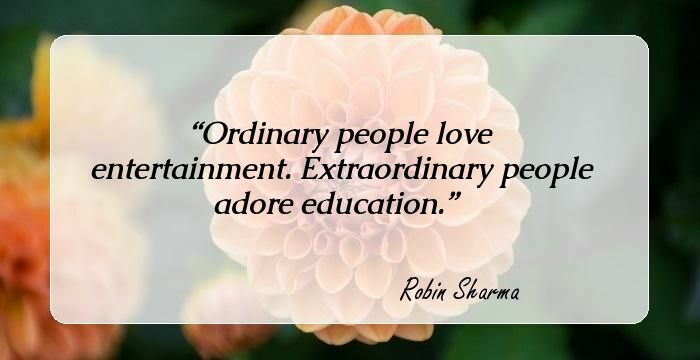 Extraordinary people adore education. Your excuses are nothing more than the lies your fears have sold you. The fears you run from run to you. Passion + production = performance. The project you are most resisting carries your greatest growth. All great thinkers are initially ridiculed – and eventually revered. The most precious resource for businesspeople is not their time. It’s their energy. Manage it well. Silence your critics. Ignore your haters. Delete your cynics. Small daily – seemingly insignificant – improvements and innovations lead to staggering achievements over time. Give away what you most wish to receive. Who you are becoming is more important than what you are accumulating. To double your income, triple your investment in self-development. The secret to genius is not genetics but daily practice married with relentless perseverance. You can’t be great if you don’t feel great. Make exceptional health your #1 priority. If you’re not scared a lot you’re not doing very much. To have the rewards that very few have, do the things that very few people are willing to do. The secret of passion is purpose. Understand the acute difference between the cost of something and the value of something. Criticism is the price of ambition.